Continuing to work on figures that I would like to construct and then do paintings of the actual sculptures, one thought has been to do a series of images based on animals that have now gone extinct. Below is an idea of using the passenger pigeon as inspiration, as well as the quagga. The quagga is an African animal that went extinct in the 1800’s. I like the idea of using them for inspiration as they are not a horse, they are not a zebra, they are a quagga! I think we feel safer pigeon-holing people with terms and labels because it makes us feel secure, rather than being at ease with the sheer diversity and variation of folks that our God and this world manifests. In our “global” and “western-centric” world I have to wonder who we’re loosing in the process. 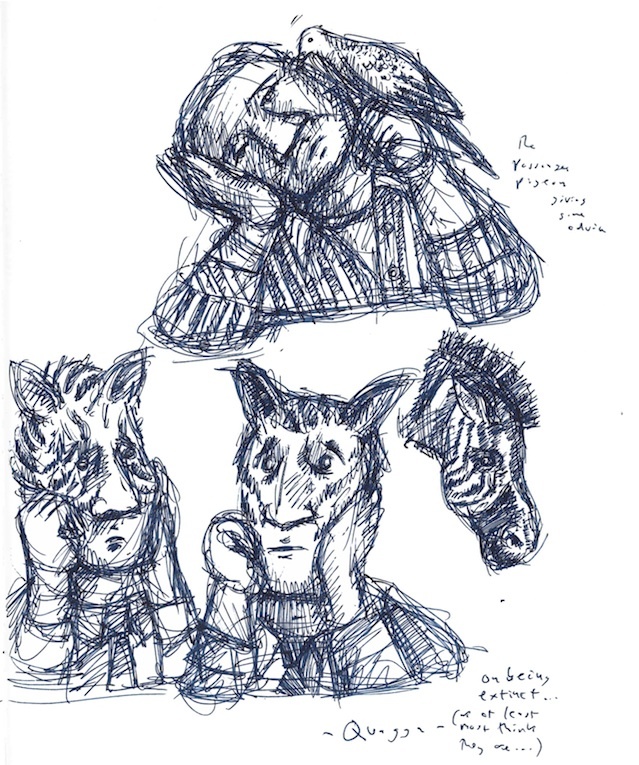 This entry was posted in Thoughts and Sketches and tagged art journaling, drawing, drawing a prayer, drawing as prayer, drawing of a bird talking to a person, passenger pigeon, Quagga, sketch, sketchbook, sketchbook images, sketchbook keeping, sketching. Bookmark the permalink.